Erin teaches a variety of different movement styles. Yin Yoga has become a fixture in many Bay Area studios and fitness centers and it is quickly gaining popularity worldwide as well. A deep and soothing alternative to more aggressive styles of yoga perfect for “people-who-do-too-much,” Yin Yoga was originally introduced to the yoga world by lineage holder and master teacher Paul Grilley. I studied directly with Paul Grilley as well as alongside Yin Yoga master teachers Sarah Powers and Paulie Zink. The emphasis in Yin Yoga is on releasing muscles rather than contracting them. Each unique class is taught exclusively on the floor, holding passive poses for 3-5 minutes each. Yin Yoga poses target the tighter connective tissues in the hips, hamstrings, and lower spine. It’s practiced in a meditative environment. As a pure flexibility practice, this is an excellent tool for meditators, aging baby-boomers, injured/active athletes, and those new to yoga. It helps release accumulated tension in the body and simultaneously find a peaceful place for the mind. Suggested class time: 90-minute class or 3-hour workshop. Excellent evening practice. Level: All levels and varieties of students will benefit from this practice. It’s great for absolute beginners, those who have sustained injuries, and athletes alike. 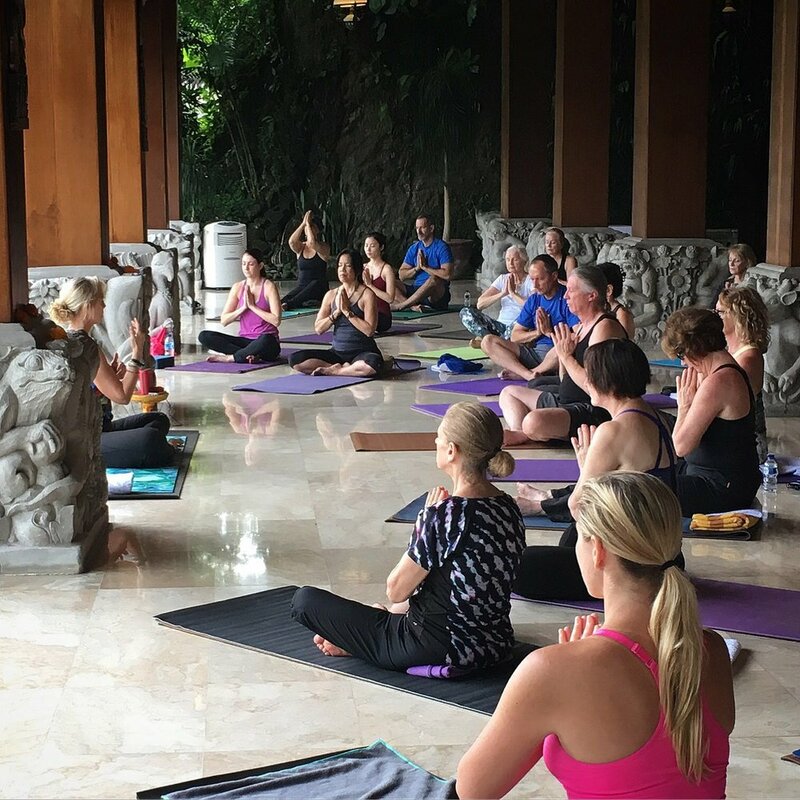 An unhurried practice of fluid and static movement, Qigong (say…Chee-Gung) Yoga Flow blends two sacred energy movement practices: Qigong (an ancient Chinese movement practiced for health and healing) and the classical Hatha Yoga. Unlike the precise forms of Tai Chi, this style of practice honors and unites both Yin and Yang (opposites) in the body with fun and easy sequences that create strength, flexibility, and essential balance. Suggested class time: 90-minute class or 3-hour workshop. Great practice any time of day. Level: All levels of fitness will enjoy this class. A thoughtful blend of the fundamentals of simple poses, easy breathing techniques, and relaxation tools, Intro to Yoga is perfect for the absolute beginner or for those managing injuries. Movement and breath are united in this practice to increase self-confidence, balance, strength, and flexibility. Suggested class time: 75-minute class or 90-minute workshop. Level: All levels welcome, especially the absolute beginner. De-stress with fluid yet uncomplicated warming sequences practiced mainly on the floor. Gentle movement and stillness are beautifully balanced to create an overall feeling of wellbeing. Enjoy simple meditation tools and breathing techniques that will leave you feeling relaxed and refreshed. Great for everyone, especially those newer to yoga. An excellent class for the workplace or corporate events. Suggested class time: 75-minute class or 3-hour workshop. A great evening practice. 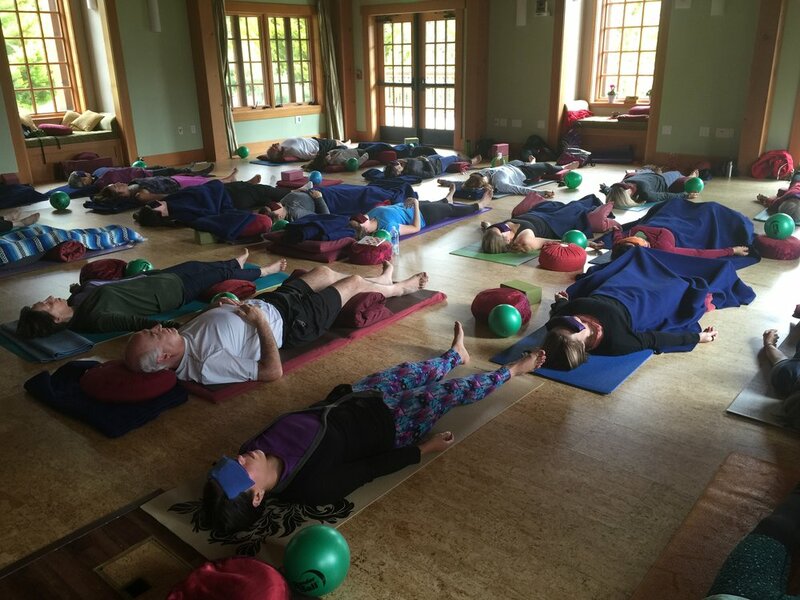 Suggested props: Yoga mat, firm pillow for sitting, blanket, and eye pillow. The MELT Method® (MELT) is a self-treatment technique that helps people get out and stay out of chronic pain in just minutes a day. When pain becomes chronic, the body’s natural state of stability and balance declines. When a body isn’t stable, it can’t be efficiently mobile. By learning how to MELT with the aid of a few tools, you can learn to actively partake in decreasing stuck stress daily so it doesn’t accumulate and cause symptoms that sap your vitality and energy. With MELT, you learn to assess your body’s stability system which helps bring your body back to a more ideal state by directly enhancing body awareness, rehydrating connective tissue, and decreasing stuck stress that accumulates from daily living. The first time you MELT, you can see and feel a difference – and over time, you can transform how your body looks and feels. With its roots in Ashtanga Vinyasa Yoga, Vinyasa Flow does not adhere to a strict set of postures. This class is a vigorous yet breath-based practice which builds strength and flexibility and challenges ranges of motion. Movement and breath are harmoniously energetic, lively, and heat producing. Each pose flows one to the other, linked by breath. Thoughtfully choreographed to tone and stretch the body, each class also devotes time for relaxation and rest. Students interested in building stamina and strength will be attracted to this style of practice. Suggested class time: 90-minute class or 3-hour workshop. Best practiced in the morning. Level: Levels of intensity can be customized to suit any degree of fitness, although not recommended for the absolute beginner.